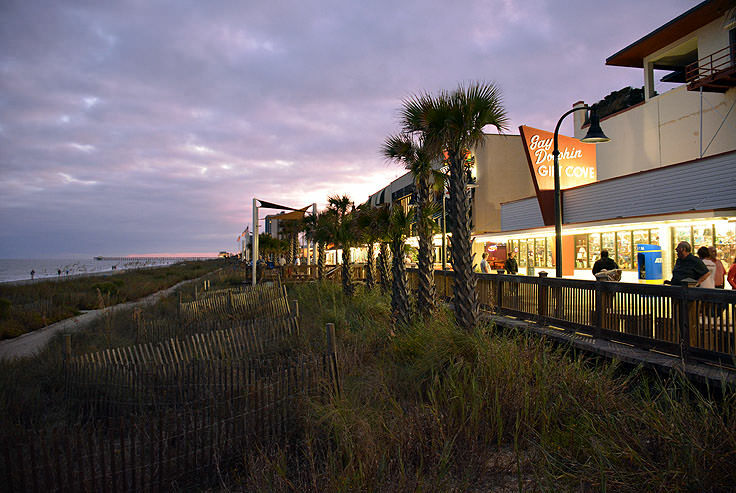 The "must-see" destination for any South Carolina Coastline vacation, Myrtle Beaches' boardwalk helped make this region the grand vacation destination it is today, and it remains a unique and quintessential component of the oceanfront landscape. 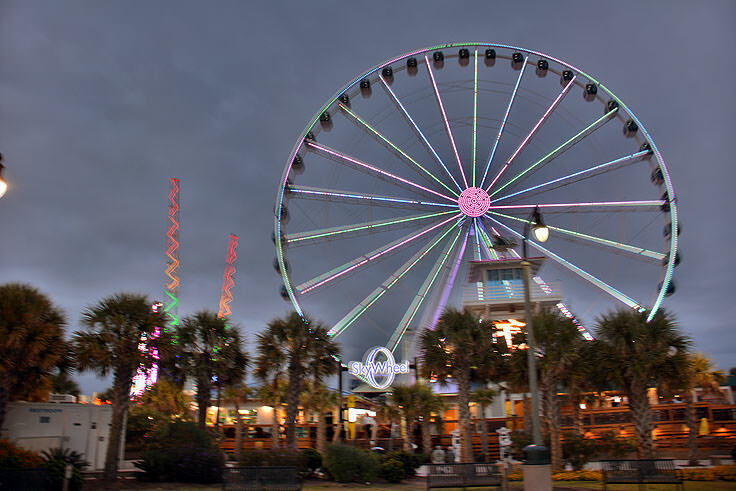 Head to the boardwalk for cocktails, a round of skee-ball, or a family friendly adventure loading up on posh apparel, souvenirs, and even hermit crabs, and it will be instantly clear why this flashy destination has been a highlight of Myrtle Beach vacations for decades. 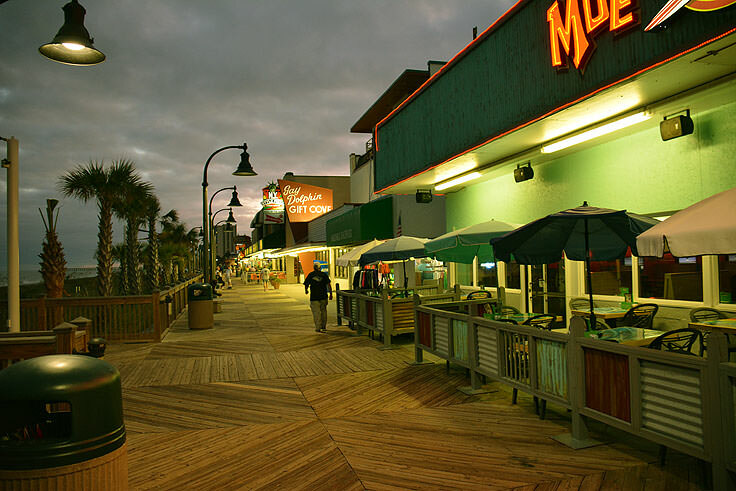 The boardwalk in Myrtle Beach was instrumental in making it the famed vacation destination that it is today. Built in the 1930s and populated by World War II soldiers on leave or stationed nearby in the 1940s, the boardwalk was essentially the home to some of the town's initial beach attractions, like local pavilions, dance halls, and the still-standing "Gay Dolphin" gift shop. In fact, Myrtle Beach's boardwalk-bordering popularity was positively booming until 1954, when Hurricane Hazel powered through the area, leaving a pile of rubble in her wake. The only stretch of this original boardwalk that remained after Hazel was a small parcel of walkway, located in between 9th Avenue North and 11th Avenue North, and the original grand wooden boardwalk was forgotten for nearly 50 years after its destruction. After another landmark closed in 2006, the original Pavilion, city officials decided it was time to get back to the town's roots and construct a new, modern boardwalk that would generate more tourism by the oceanfront. Over the next few years, plans and blueprints flew back and forth between local officials and prospective designers, until a 1.2 mile boardwalk was finally approved, with groundbreaking beginning in September of 2009. The boardwalk was completed in installments, with an official ribbon-cutting ceremony in May 2010 to coincide with and open the locally acclaimed Beach Music Festival. And while the current 1.2 mile length, complete with shops, amusement parks, area attractions, and restaurants, is certainly more than enough to keep a Myrtle Beach vacationer busy, plans are already in the works to increase this length to 4.6 miles, making the boardwalk longer than its Atlantic City, New Jersey counterpart, and extending the boardwalk's borders all the way to neighboring North Myrtle Beach and beyond. Since the new boardwalk's completion, Myrtle Beach has received rave reviews. 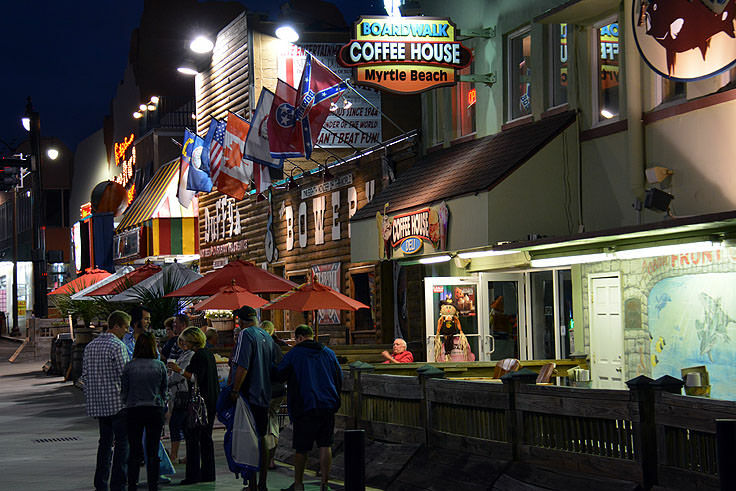 The National Geographic Magazine has recently ranked the Myrtle Beach Boardwalk as number three in the "Top Boardwalks in the United States," while Travel and Leisure Magazine has given the boardwalk the national number two spot. 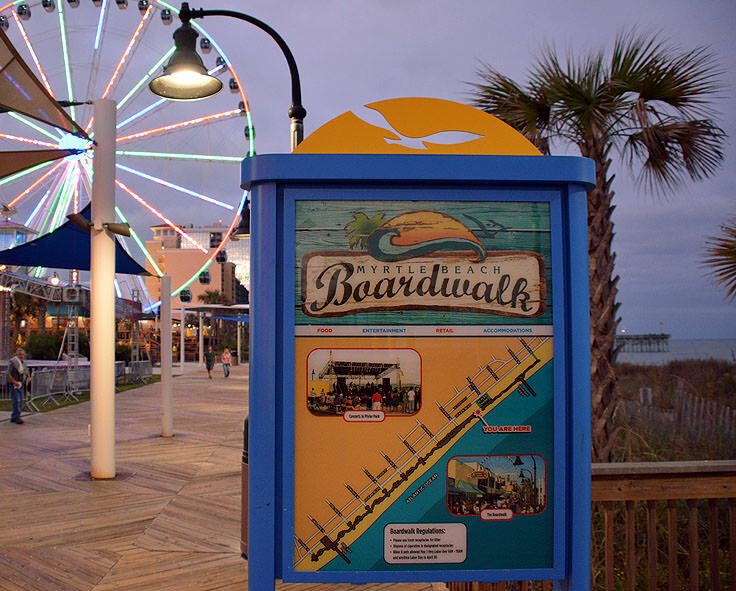 Longtime visitors, perhaps the best gauge in such a competition, have agreed and have unanimously said that the boardwalk is the perfect "go to" destination to enjoy the best of Myrtle Beach, effectively serving as a wide walkway that just barely separates the white sand beaches from the cool oceanfront attractions. 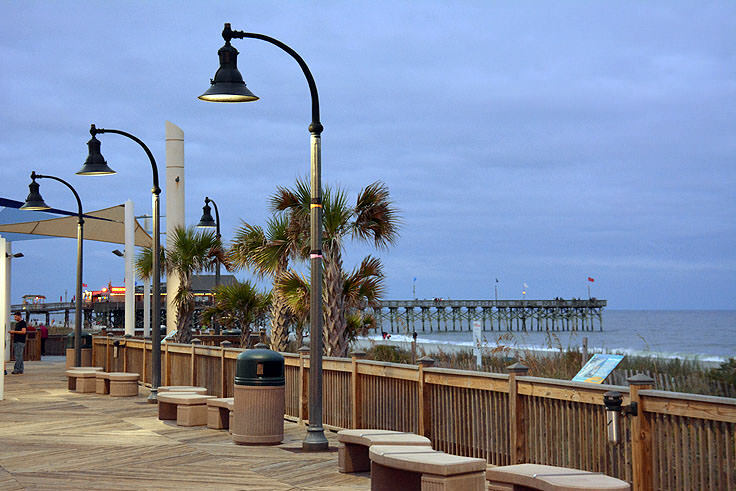 Today, the Myrtle Beach boardwalk is a wide oceanfront walkway which features countless benches overlooking the ocean, plenty of elbow room for thousands of visitors, and a canopy of overhead lights and American flags to guide the way. 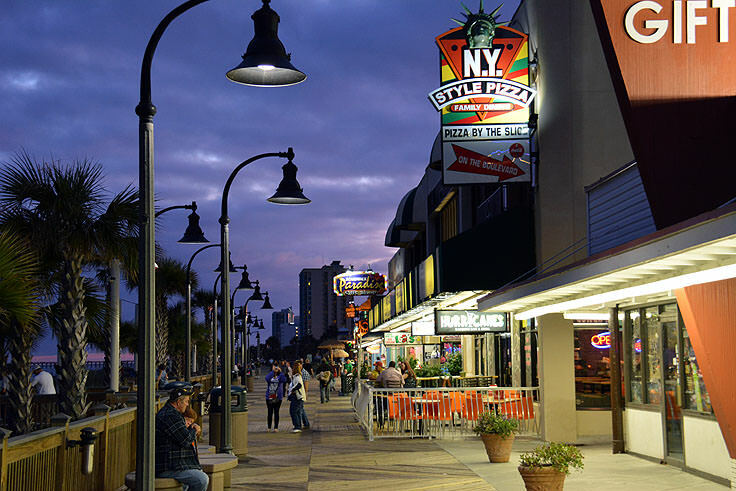 Bordering both the beach and many of Myrtle Beach's best loved attractions, restaurants, and shopping centers, the boardwalk is an effective "go-between," allowing visitors to enjoy both the wide open Atlantic views, and the cool commercial hotspots that has made this community a star on the East Coast vacation front. 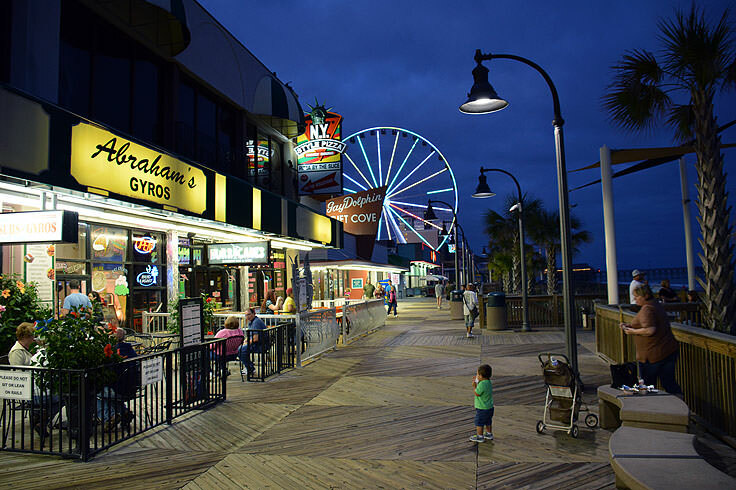 Several promenades and commercialized sections gives the boardwalk an almost carnival-like atmosphere, although visitors will still find ample benches close to the oceanfront railings to relax and take in the water views. 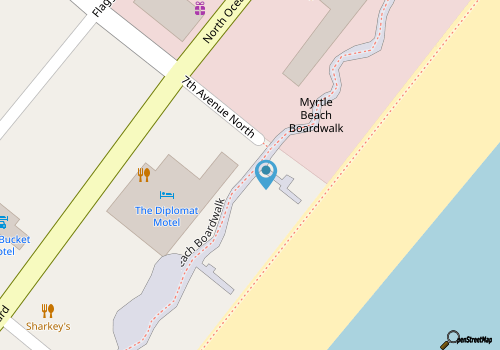 Local resorts, hotels, and motels now feature boardwalk-front accommodations, and visitors will find ample restaurants, bars, and shops adjacent to the wooden walkways. Skee-ball games, boutique shopping, and fresh seafood meals on a covered patio overlooking both the boardwalk and the oceanfront are always in season, and vacationers are always within strolling distance of big name attractions like Myrtle Beach's acclaimed amusement park and arcade, and local museums like Ripley's Believe it or Not or the Magiquest Center. The main promenade is especially popular, and features the renowned "Sky wheel," a towering Ferris wheel that boasts uninterrupted views of the Atlantic Ocean in the distance. Longtime Myrtle Beach vacationers will be pleasantly surprised by the new Myrtle Beach Boardwalk, a startling recreation of the 1940s and 1950s original, and an incredibly easy transport to the bars, beaches, restaurants and attractions that have made this coastal town one of the Eastern Seaboard's most recognized fun vacation destinations. 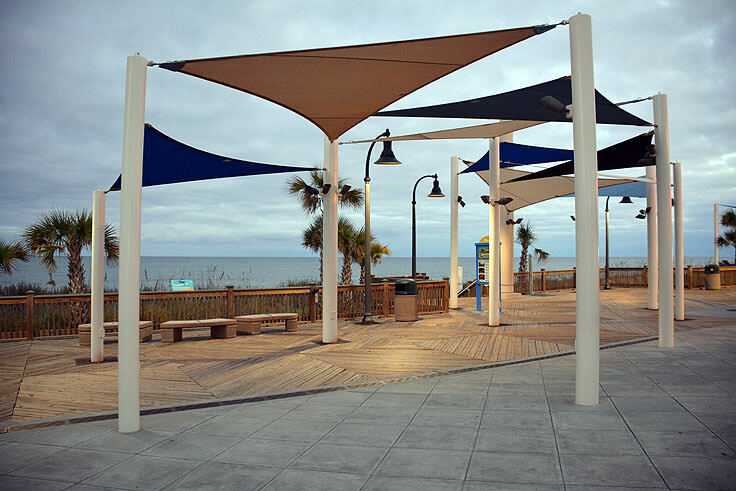 Open to the public, and enjoyed by visitors of all ages, the Myrtle Beach Boardwalk both honors the community's past, and leads Myrtle Beach into the future with handicapped accessible facilities and plenty of room to roam. Check out this local landmark in its current state, and come back in the future to admire the 4+ mile expansion, and it will quickly become clear why Myrtle Beach still holds the crown as the king of the East Coast vacation destinations.